When we went to Perth with my oldest son, we tried to get a souvenir of tie for my hubby. And we went to a big department store in Perth. But I couldn't find a nice tie which was made in Australia. Then my son found a clerk who had a nice bright blue tie. I asked the clerk "where can I find one like that?" He said "I'm sorry. I bought it in the other store." I aked him again "Where can we buy it?". He thought several time. Then he answered "you can buy it in a store called Target." Mabe if we were native, he would not tell us. He was a very honest person. He told us how to get to that shop. And we got a tie. But unfortunately after we came back to Japan, we found that it didn't suit my hubby. This tie has been in our dresser forever. Mybe he might not be useed to wearing bright ties. 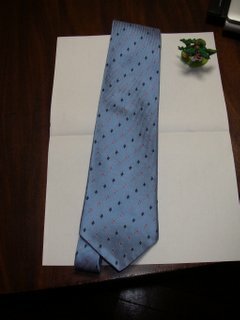 I thought this tie would suit that lyoung person who lived in Perth, when he goes out on a sunny day. Nice tie, I have a couple just like that. I think you suit like that tie.